Dormani Yarns do not trade, sell second hand machines but Tony our expert on knitting can help you by advising what type of machine would be best for your requirements and what to look for in a second hand machine. Once you have purchased your machine Tony can also provide lessons on how to use your machine. Since 2000 the major suppliers stopped importing into Australia new Knitting Machines, saying the market was too small to warrant the investment. There are new knitting machines that are manufactured in China that are being imported into Australia. Parts for Brother Machines are still available and for older machines substitutes are available. If you are interested in taking up machine knitting for the first time a good second hand machine might be the way to go. These machines range in price from as little as $50 to several hundred depending on the model and condition of the machine. 1. GAUGE – This is the size of the needles and how close together they are on the machine bed. The gauge of the machine will decide what yarn you can use in regards to yarn thickness and type. Uses very fine yarn to produce very fine knit fabric that is typically seen in manufactured clothing. Uses a variety of yarns and thicker type yarns can be used by selecting every second needle. 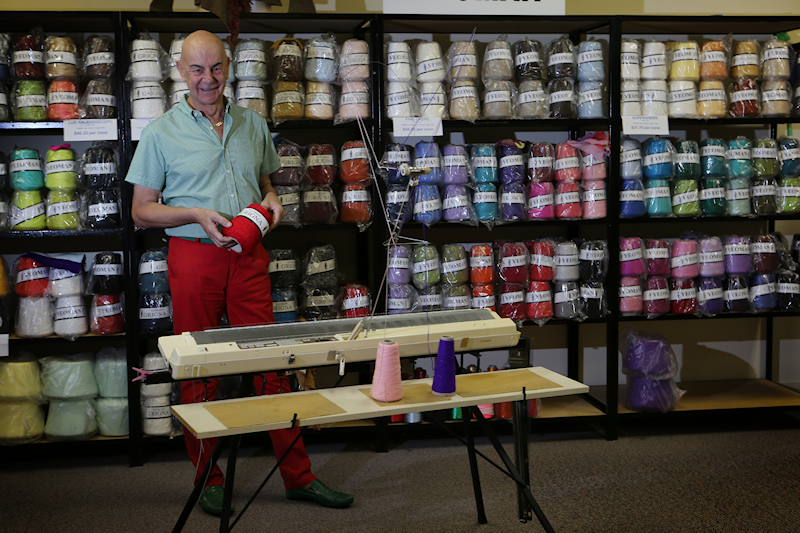 This is the most popular of the knitting machines available. Uses regular to thicker yarns and garments look much like hand knitting. These machines were designed to combine the best of the standard and bulky machines. Use thick yarns and looks like hand knitting. (a) Punchcard machines read a special piece of graph treated card that has holes punched in it that make the stitch design/pattern to be knitted. This system is limited to a 24 stitch per row pattern. (b) Electronic machines have a “computer” built in that can be programmed. These machines can have stitch designs/patterns that are the full width of the needle bed per row. Once you have decided on the manufacturer then decide on the model that will best suit your needs. (b) If it has not been used in a while ask where it has been stored. Moisture and dust are NOT friends of knitting machines. (c) When was the last time the sponge/retainer bar replaced. Ask to see it – if it is really flat this is really old = machine not well maintained. (d) Ask if the seller is the original owner, if not do they know how many owners the machine has had. (e) Ask what type of oil has been used on the machine. If general purpose oil then the machine will probably need a thorough service to remove gummy areas. 9. Do not get caught discussing the original cost of the machine it has nothing to do with current pricing. LIKE NEW – Good to excellent condition. You would only need to dust it off and start knitting. It has a new sponge/retainer bar and thoroughly cleaned. This machine should have no yellowing. EXCELLENT – Good to excellent condition. Expect to clean it and maybe replace the sponge/retainer bar. Again the machine should have no yellowing. GREAT/GOOD – good condition expect to clean it and replace the sponge/retainer bar. Some yellowing maybe present. GOOD/FAIR – Expect to clean it, replace the sponge/retainer bar and expect minor repairs and servicing of the machine. Yellowing will be present.